If you have kids, you are familiar with the questions, "When are we going to get there? ", "How much longer? ", and, "I'm bored. What can I do?" Keeping kids engaged during a family outing or activity can be challenging at the best of times. While tablets and cell phones are handy to have, they aren't always practical. Batteries run out, wifi isn't always available, or tensions are strained when sharing is necessary. What can a family do to enjoy the journey as well as the destination? 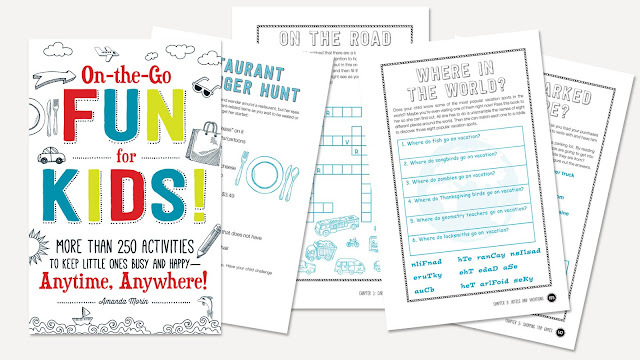 Enter, Amanda Morin's latest book, On-the Go Fun for Kids! : More Than 250 Activities to Keep Little Ones Busy and Happy--Anytime, Anywhere!. Packed full of activities to keep kids of all ages busy and happy during car trips, on planes, trains, in hotels or while shopping, it is also a book that is written for kids of all ability levels and interests. Using her expertise as an educator and parent, Ms. Morin ensures that there are activities that appeal to various learning styles. There are word games, opportunities to draw, observation games, brain teasers and even ideas for those tablets and cell phones. Many activities can be easily used and/or adapted for kids with learning issues. For example, page 33 suggests a game called, "Road Sign Bingo", in which symbols are used instead of words. While some activites require adult support, most can be done independently or with a partner. For example, "License Plate Delight" on page 18, can be played while on a road trip with one child or the whole family. It requires the participants to count the number of license plates from the state you are in. In addition, there are interactive pages that kids can write, draw or doodle on. "At the Zoo" on page 20, asks kids to circle the differences between two similar pictures of a zoo. Finally, there is a bonus chapter at the end of the book with ideas to keep kids busy when Mom or Dad have work to get done at home! With its easy-to-read format and kid-friendly graphics, On-the-Go Fun for Kids, is small and lightweight enough to put into the pocket in the back seat of a car or in a carry-on bag. You won't want to leave this book at home the next time you step out the door for a vacation or trip to the grocery store. It is a book that every family needs to have! You can find On-the Go Fun for Kids! : More Than 250 Activities to Keep Little Ones Busy and Happy--Anytime, Anywhere! in your local bookstore on online at Amazon.com.